AAP leader Yogendra Yadav has said that the possibility of Kejriwal's resignation cannot be ruled out. Arvind Kejriwal decided to resign as Delhi Chief Minister as his Jan Lokpal Bill was blocked from being tabled in the Assembly. 8.35 pm: The Centre thinks it is some British government, and Delhi Lt Governor feels he is some viceroy, says Kejriwal. 8.31 pm: The BJP and the Congress have shamed the Delhi Assembly and Parliament, says Kejriwal. 8.30 pm: Arvind Kejriwal announces the resignation of AAP government in Delhi, says he will meet Lt Governor Najeeb Jung shortly and ask for the state Assembly to be dissolved. 8.27 pm: The Congress and the BJP didn’t let us table the Jan Lokpal bill because we filed FIR against Mukesh Ambani, says Kejriwal. 8.26 pm: The Congress and the BJP joined hands for the first time in the history of the country, says Kejriwal. 8.25 pm: Arvind Kejriwal addresses supporters at AAP headquarters. 8.05 pm: Arvind Kejriwal is expected to announce his resignation as the Chief Minister of Delhi shortly. 6.55 pm: Kejriwal must stop making false allegations, says Harsh Vardhan. 6.53 pm: Harsh Vardhan accuses Kejriwal of trying to benefit power supply firms owned by Ambani. 6.34 pm: Kejriwal alleges that Mukesh Ambani gives donations to both BJP and Congress, therefore, they did not dare to file FIR against them. “BJP and Congress did not allow introduction of bill because of FIR against Mukesh Ambani,” says Kejriwal. 6.32 pm: Kejriwal says he is willing to sacrifice his life for the sake of Constitution. 6.31 pm: “It is being said that we took an unconstitutional step with regard to Jan Lokpal Bill, it was said that we need Centre’s nod for it…but I read the whole Constitution and found that there is no such norm in it,” says Kejriwal. 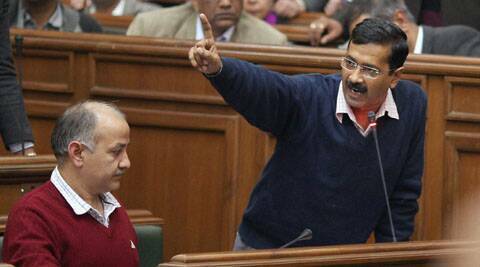 6.27 pm: Kejriwal asks Assembly members to stop disruptions and introspect. 6.21 pm: Kejriwal’s speech interrupted by several members of the Assembly, including BJP’s Harsh Vardhan. 6.15 pm: Delhi Chief Minister Arvind Kejriwal speaks in the Assembly. At the onset of his address, Kejriwal says he may use some “harsh words”. 6.10 pm: Supporters gather at AAP headquarters in large numbers. There is a popular demand for Kejriwal’s resignation at the party office. 5.45 pm: AAP leader Yogendra Yadav says the possibility of resignation of Delhi Chief Minister Arvind Kejriwal cannot be ruled out. He, however, added that a final decision can only be taken after a meeting of AAP leadership, adding that Kejriwal had already made his stand on the issue clear. 5.18 pm: BJP says that the Congress was rightly punished by the people of Delhi in the Assembly elections. 5.04 pm: Aam Aadmi Party’s proposal for introduction of Jan Lokpal Bill struck down. Defying Lt Governor’s advice, the AAP Government on Friday tabled the Jan Lokpal Bill in the Delhi Assembly amidst stiff protests from BJP and Congress members triggering an uproar and forcing adjournment of the House. Amidst chaos following opposition demands for voting on the LG’s advice to the Assembly against introduction of the Bill without following constitutional procedures, Chief Minister Arvind Kejriwal got up to say he was tabling the Bill. Trouble broke out immediately with BJP and Congress members opposing the government’s move and shouted slogans saying the government cannot violate the Constitution. As arguments continued, Speaker M S Dhir announced that he was allowing tabling of the Bill and wanted discussion at the introduction stage. However, the opposition members rushed to the well protesting against the Speaker’s decision resulting in chaos and forcing the Chair to adjourn the House for 30 minutes, the second in the afternoon. 2:20 pm– Harsh Vardhan says the Assembly cannot function if a minister indulges in improper conduct. 2:17 pm– BJP leader Harsh Vardhan questions the conduct of AAP minister, urging the speaker to act against him.